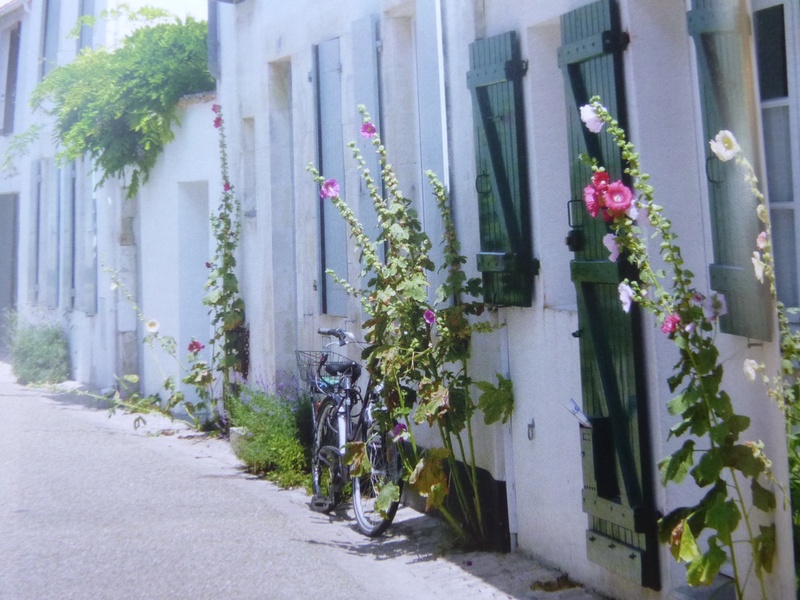 We stayed seven nights at Île De Ré. The weather was mixed but when the sun shone the cycling was wonderful, each of our senses was entertained with lovely views, sounds and especially smells. When it rained the perfume of the wild flowers mixed with the smell of the ocean. It was good to be outside. We made full use of the evening visits of the pizza van. He lit his wood fire at 5pm and did a roaring trade throughout the evening, taking a ball of dough, quickly rolling it to paper thinness before adding the toppings – starting always with fresh tomato sauce. The result was a crunchy, wood smokey delight, complete with dribble bits, far removed from the stodgy, oily things one usually gets in the UK. We stopped overnight on our way to Eurotunnel at La Crotoy where we had our last seafood meal and next day we bought fish and little Baie De Somme prawns to bring back to the UK for supper that evening with Kate and family. The crossing was quick and easy and within the hour we were sitting having a cuppa in Folkestone. It was wonderful to be in UK again, being away for so long made us appreciate how special is this place we call home. 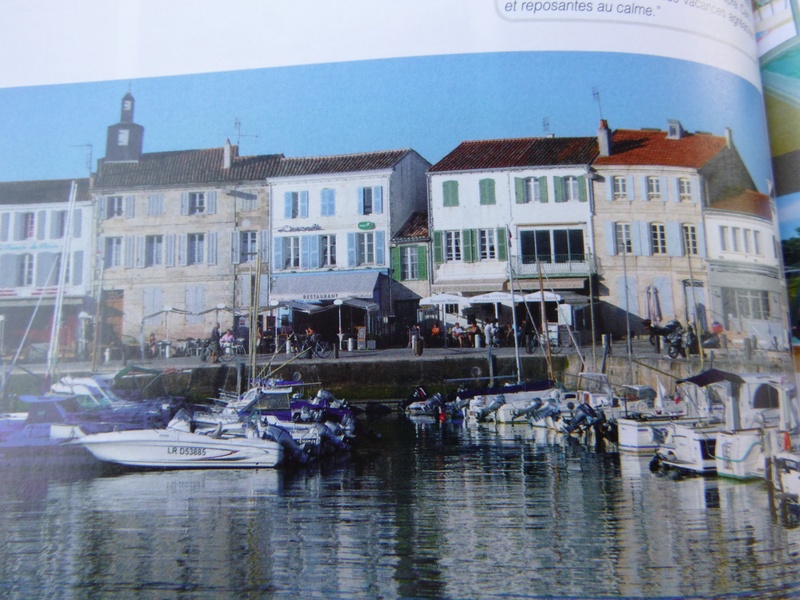 We set off next morning for the Île de Ré on the west coast of France near La Rochelle. The island was 30K long and 5K wide, connected to the mainland by a toll bridge. The island was famous for its oysters and the production of sea salt (and soap made with donkey milk). It was a wonderful place for exploring on a bicycle. Its towns and villages were all connected by cycle paths and dotted along these paths were numerous oyster sheds with tables and chairs outside, selling oysters (and often other sea food) either to consume on the premises or to take away. For €10 you got a dozen oysters, the freshest bread ever, with butter, and a glass or two of wine. The landscape was very open with few trees and if it rained . . . . you got very wet. out of the old stone walls. The shutters and doors of the traditional white stone houses were all painted the same colour, usually green or blue. The narrow streets led down to the busy harbour area, full of restaurants with their tables and chairs spilling out on to the wide pavements. 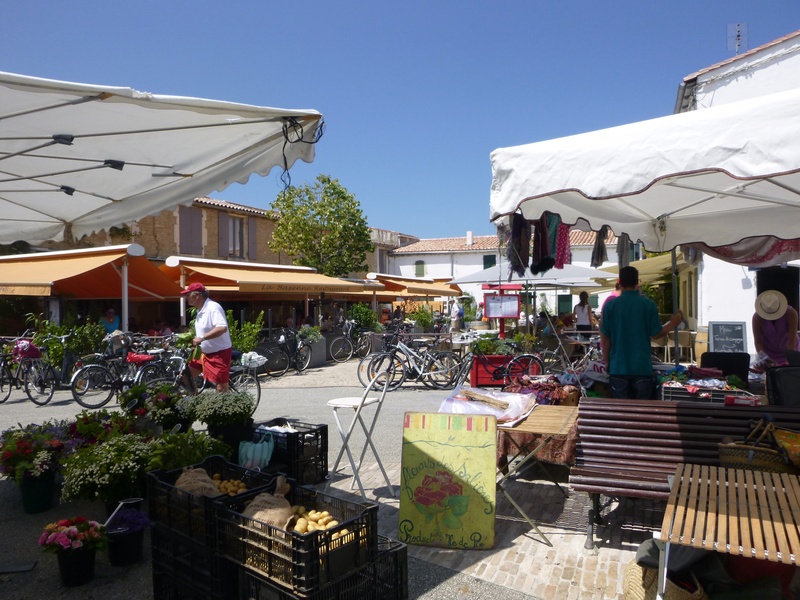 We marvelled at the number of small shops all selling the same souvenirs and sailing type clothes with the blue Breton stripes. In Spain it was normal to have separate shower blocks for men and women – but not so in France, everyone used the same facilities so, after showering, for the sake of modesty, it was not possible to come out of your wet shower stall to find a dry area to dress yourself as you would do in the “Ladies”. Therefore much thought was needed about what to wear when going for a shower. The walk to the shower block took you past other campers sitting outside enjoying the view so I chose not to adopt the Hyacinth Bucket style of pink dressing gown with matching fluffy slippers especially as French campsites often don’t supply loo paper so a toilet roll had to be carried proudly under the arm. My choice of outfit was practical rather than attractive, track suit bottoms topped with a loose blouse (no underwear) so, when showered, I could dry above waist and put on blouse whilst still in wet shower stall, then wrap towel securely round my waist, skirt style and sashay back to camp holding tightly to the towel. One morning, when I left the showers wrapped neatly in my towel, I remembered that I had ridden my bike to the shower block. I felt it would be courting disaster to ride back relying on a clutched damp towel to retain my modesty so I had to retrace my steps to the privacy of the shower stall and put on my track suit bottoms (balancing on one leg to avoid wet floor). Only then could I cycle back with confidence, running the gauntlet of other campers sitting outside having their breakfast. My days were filled with such dilemmas.